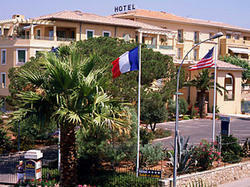 In the South of France, at the exit of the A7 motorway, and in the heart of a peaceful and charming seaside resort, the BEST WESTERN Soleil et Jardin offers a various range of facilities, which will satisfy both the businessman as well as the family on vacation. It is a pretty new property, fully air-conditioned and soundproofed, located at five minutes walking from the beach, the city center of Sanary and the harbor. In the city center, you will find a typical daily market of Provence, and various nautical activities, such as fishing in the open sea, visit the Calanques, or visit the surrounding islands (les Embiez, lles du Levant, Bendor). Not far away from Sanary, you can also enjoy an 18 hole golf course, visit local vineyards, or the road racing set of the Castellet. We offer 25 unique and personalized rooms, ten junior suites and five suites, spacious and comfortable, with sea view for some of them, or terrace for others. You will find cable television, dataports, Wi-Fi, and bathrooms with tub, hairdryers and dressing gown. We are open all year and have a secured carpark. You may also organize your meetings in one of our sub-committee meeting rooms (up to 120 people) Finally, we invite you to check our relaxation area with an outdoor swimming pool and two cabines for estetic care.